You may be familiar with Jay Howell’s artwork. As the creative designer of Fox Network’s Bob’s Burgers Belcher family and co-creator of Nickelodeon’s Sanjay and Craig, his creativity may regularly flow into your daily life without you even realizing it. Not only is Jay a prolific artist, but he is also an informal dog rescuer. He adopted Street Dog after finding him, well, on the street. (Follow Jay on Instagram so you can witness the adorable pair’s adventures together.) Dogster chatted with Jay about art and life with dogs. 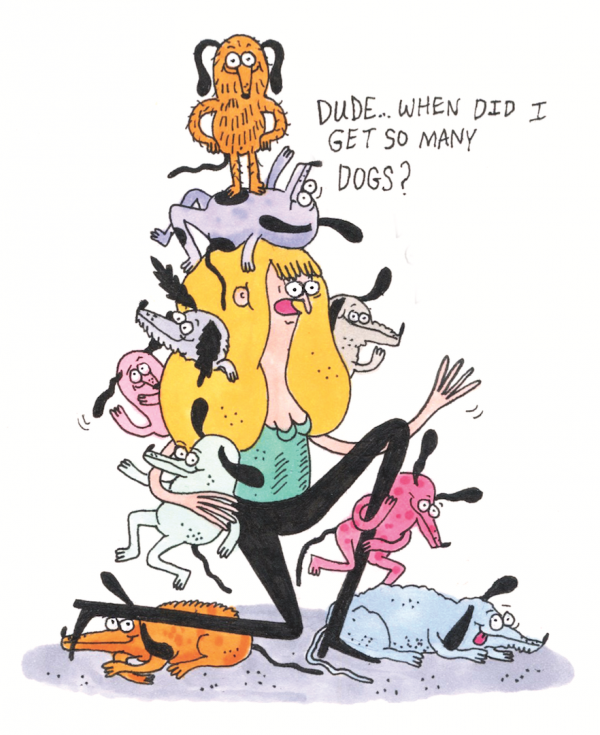 Dogster: Tell us about your AKA Gallery exhibit in Portland, Oregon, this past Spring — how are dogs significant? Dogs are one of the most significant things in the world to me. Dogs show me that pure happiness and kindness exist in our world. I feed off of that energy, and it makes me excited to make work. I love being happy. Talk to us about Street Dog. How did he come into your life? I found Street Dog on the way home from lunch five years ago. He was 2 years old and almost died a handful of times. I had to bottle-feed him and raise him like a mamma dog. I am a mother dog now, and I’m OK with it. What role do you think companion pets like dogs have in enhancing humans’ quality of life? It’s the best. Dogs get you up every day, and they’re always in good moods. Street Dog is my best friend, and I get to spend every day with him. He brings me exercise, discipline, and, most importantly, laughs. Are there any rescue groups that you actively support? Chris Hink’s FurBallTv on Instagram is a good way to check out shelter videos in the Los Angeles area. I always donate art to any dog cause. Email me about it! Do dogs play a role in your creative process? Yeah, I draw dogs almost every day. I have forever. Dogs have given me so much. I love them. Check out Jay Howell’s blog, Instagram, and book. The post Dogster Chats With Cartoon Creator and Dog Lover Jay Howell appeared first on Dogster.